Todays topic on Flaming Hot! is “how much time does it take to run your business?” My answer: too much time! However, I wouldn’t trade it in. Well, maybe some days I dream of walking the beaches in far away lands and think I am going to scream if I have to edit one more picture, but then I come back to reality and tell myself how great my job is. Really, it is so much better than working for the man. I don’t think I could do it…or at least I wouldn’t be happy about it. So the gory details. Here is my typical week. Edit photos of at least four new things, a set. a few marbles, a daily special, a focal bead. (Greg takes the photos). There are at least three pictures of each thing and can be up to twelve depending on the item. Crop, balance, resize, etc. Load four auctions on ebay, one to Justbeads, add an item to etsy and change the daily special. Load a daily special to the website. Shipping. Package up all items to be shipped, print labels and take them to the po. I torch for about 5 hours usually starting at about 4 pm and finishing at about 9pm. I get to the torch as early as possible, usually by 1pm and work until about 9 pm. My so called day off. I only load actions and do shipping this day. (Great day off right? :-)) I am usually done by 12 noon. Off totally. I usually don’t even answer emails this day. Consider yourself lucky or important if I do. Added to this list is posting on forums and etsy treasuries for marketing purposes. I don’t have this scheduled, so it just happens when it happens. How much time, well if I add up the hours I am gonna say at the very least 24 hours a week goes into extra stuff besides creating. I don’t think it would be a stretch to say I work at least a 50 hour work week. But who’s counting? 99 Cent Friday & Tuesday! oops, call me slacker. I forgot to blog 99 cent Friday. So here is Friday and Tuesday. Enjoy! Do you set goals for yourself? I do. Lots of them. Torching goals are four new things to list in various places 6 days a week. Going right along with that is getting those things listed, which means getting pictures edited and descriptions done. Exercise for thirty minutes at least five days a week. Write 1000 words a day on various writing projects. Blog at least three times a week. Spend at least one day a week out playing somewhere with Greg. Take a day for just me to do whatever I want. I am horrible at this one. Once Greg literally yelled at me when I was packaging up items to ship out on my day off, (which is Friday) cause I didn’t want the customers who just paid to have to wait for Monday. Now, those who know us, probably have trouble seeing Greg yelling at me. 🙂 Now I always do ship on Fridays, but I usually do that first thing in the morning and later payments are suppose to wait until Monday. Ideally I should ship on Thursdays, but that is my big torching day. I get the kiln all to myself, no sharing with hubby, so I don’t. Anyway you can see I have issues with taking a day off, even though I really want it. The bad thing is I get upset with myself when I don’t meet my goals. I have other ones too that deal with various marketing groups and other guest blogs as well. I do my best. The thing is, I keep adding more and more stuff for me to do, as if I don’t have enough to do already. I am a full time lampworker, torching 5 days a week anywhere from 3 to 6 hours a day. Most often we are looking at around 5 hours. Then all the computer work with running the business. Greg does do his share. The lovely man cleans all my beads for me, even though he rarely makes any and he takes all the pictures. So I am busy, with goals that I want to meet, try to meet and am serious about meeting them. I am nothing if not motivated, usually. My problem this week is the motivation has left the building. At least I am checking one thing off my list. Blog entry done, even if it is just rambling at it’s worst. Cheers. Whoops, forgot to post this one. Enjoy. My main focus of diversification is in product line. Though, I admit florals do seem to take over and are the main theme of my work. What can I say? They sell well and nothing is a better motivator for a self employed artist than when something sells well. I really admire artists who are continually changing and coming up with new styles and ideas. The ones who do it really well. You know, the ones who seem to turn everything they touch into a masterpiece. 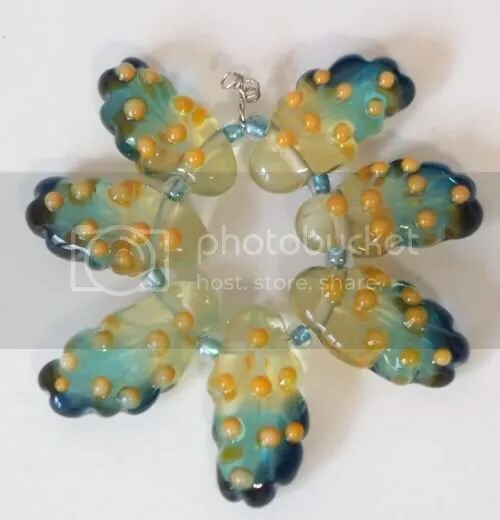 It would seem they cannot make an ugly bead. Oh, I know you are thinking, yes they can, they just don’t show those. Well, that is what I thought too, until I meet some of them in person and had a chance to see their rejects. At one point the rejects of an admired bead maker, were miles beyond what I was trying to sell. I literally did not know what was wrong with them, nor did I care. I happily pocketed them when they were offered and still admire them (though I still have trouble seeing what was so wrong with them even four years later and a lot more beads under my belt). My point in telling you that is this: I just don’t seem to be the type of artist that color and design come naturally to. I have to work at it, keep working at it, and then work some more. I have always thought I was slow learner. Slow, yes, but I do eventually get there, if I try hard enough and with enough repetition. So I keep beads that I have spent a lot of time perfecting in my product line. I have added simpler ones I call simple elegance. Simple beads, ones I deem easy for me to make, certainly can make a beautiful piece of jewelry. It all doesn’t have to be a masterpiece. Then I continue to work on what I call, Collectors beads. 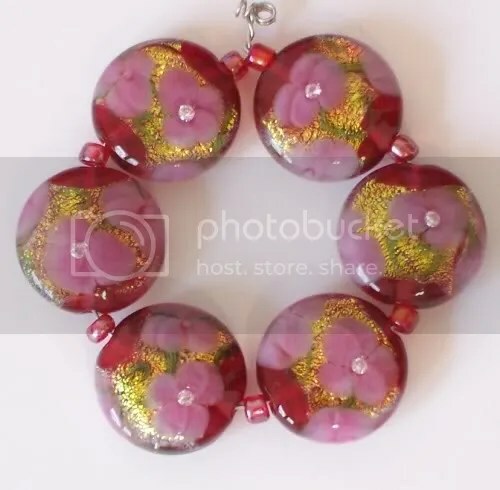 Art beads. Beads with expression maybe. It takes a long time for me to perfect these beads. Sometimes I lose interest along the way. Other times I put them away and then come back to the idea, and sometimes, rarely, one takes off pretty quickly and a new line is born. Recently I learned to make marbles. Okay about a year ago, but this year I have been steadily working on them. They are a different animal all together. I don’t consider what I make in marbles a part of my product line, though the sparkly floral ones could be considered that I suppose. Marbles get to be all about expression and I like that. The buyers are a different breed from bead buyers too. With marbles it is all about collecting, while beads are mostly for design. Though there is some crossover in the buying public. So my diversification in how I add to the bottom line is; a production line I can fall back on and marbles. I sell it all online in different venues. 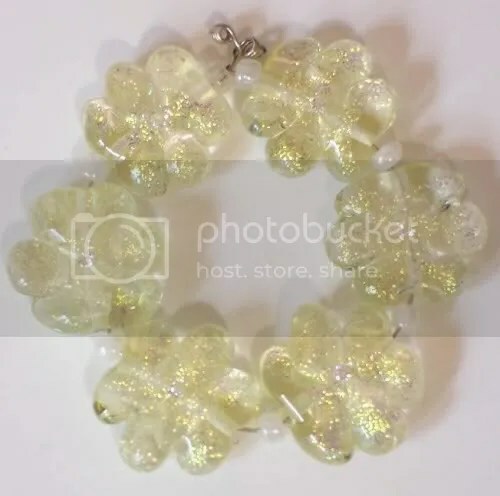 Website, Ebay, Justbeads, and Etsy. It’s all about exposure you know. I don’t really make jewelry to sell. First of all, I think jewelry is something you need to see in person, or most people do before they buy. Since I don’t do shows, that doesn’t work for me. Second, I don’t have much time to make jewelry. Third, my customers are much better at it that I am. Why would I compete with that? 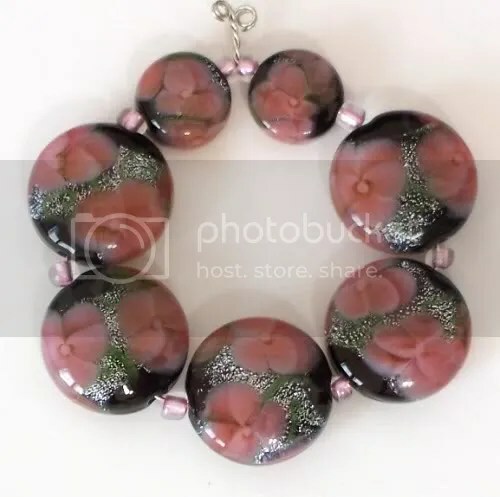 (However, I can make simple pendants and bracelets and things, so if you are not a designer but want some of my beads made up into something, it never hurts to ask. You just won’t see much in the way of finished product in my outlets). Yes, you heard that right. I don’t do shows. Should I? Maybe. It’s just that the cost of booth fees, airline, travel and food to do them are really expensive. I’m just not sure doing a show would be economically sound. However, the networking and connections to be made are probably worth it. So I didn’t say I would never do shows. I just don’t do them now.